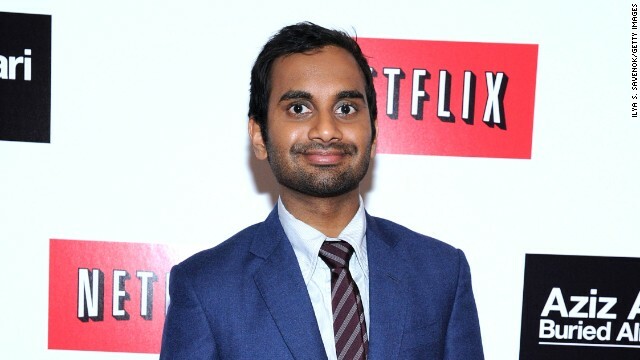 Comedian and actor Aziz Ansari may have hit movie gold during a boring flight. (CNN) -- Well, that's one way to crowdsource. "Parks and Recreation" star Aziz Ansari tweeted Sunday that he was bored on a flight, and what followed had all of the makings of a Hollywood movie. The comic questioned why there has never been a film about a haunted plane: "Wouldn't that be dope?" He then started tweeting ideas and a script for a project he dubbed "Ghost Plane." Quicker than you could say "I'll make you a star," #GhostPlane took off. Bored on my flight and just wondering - why has there never been a movie about a haunted airplane? Wouldn't that be dope? "Dude. For real. Is any studios into GHOST PLANE? I can make it cheap. It's all one location. Just the plane," Ansari tweeted. Dude. For real. Is any studios into GHOST PLANE? I can make it cheap. It's all one location. Just the plane. The idea goes like this, according to Ansari's tweets: "Open on Indian guy RAJ (Aziz Ansari) saying bye to his parents. He gets on the plane. But this plane is actually a GHOST PLANE. #GhostPlane." "Raj uses the plane washroom pre-takeoff. He sees a face in the mirror. 'This might be a ghost' he thinks.... #GhostPlane," the actor added. Don't even worry about casting. There's a role for Jennifer Lawrence as "Flight attendant Anne" and fellow Academy Award winner Tom Hanks as "The Captain." But our favorite character might be embodied in this tweet: "A mysterious man in a hoodie: 'If you want to stop the dolls. You need my help.' He lifts the hood: ITS LIAM NEESON AS HIMSELF! #GhostPlane." Because of course it's Liam freaking Neeson. Fans were really into it. On person tweeted, "Now I can't sleep because @azizansari is telling the most magnificent story #GhostPlane" while another said, "A studio needs to pick up @azizansari's #GhostPlane IMMEDIATELY. If not we'll just make a kickstarter. It'll be cheap." A studio needs to pick up @azizansari's #GhostPlane IMMEDIATELY. If not we'll just make a kickstarter. It'll be cheap. We will have to wait to see how it all pans out. Ansari said, "Sorry everyone. #GhostPlane is on pause. I just got home and have to be up early to shoot Parks. I'll try to finish this sometime." Sorry everyone. #GhostPlane is on pause. I just got home and have to be up early to shoot Parks. I'll try to finish this sometime.